Former president General (r) Pervez Musharraf has refused to rule out a return to public life saying he is ready to offer his services if his country remains “in trouble”. Musharraf said he was enjoying life speaking on the lecture circuit. “I wish the government well and that they must handle Pakistan and take it forward with peace and economic development. If that happens … I would be the happiest person continuing whatever I’m doing,” he said. Musharraf blamed Afghanistan as the source of Pakistan’s problems and renewed his feud with Afghan President Hamid Karzai accusing him of “double dealing”. “We have suffered because of what is happening in Afghanistan. And we still continue to suffer because of that. Our society, I would say our social fabric has been torn. And we are trying to repair it,” he said, demanding an end to Western criticism of Pakistan’s army and powerful intelligence service. 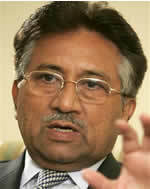 Musharraf also attacked criticism of how more than 10 billion dollars in US military aid was spent by his regime. “Five billion, half of it, is reimbursement for the (military) services provided by Pakistan. It is not your money, it is our money,” he said, adding the rest went on social spending and on maintaining Pakistan’s air force. NAWAZ AND ZARDARI are jokers of pakistan who are bent to earn money,wrecking vengence on opponents and destroying pakistan.musharaf is a man with guts.he is a brilliant man who can serve pakistan better than any body else,but he needs support.i realy feel disgusted to see pakistani tv channels downplaying his acheiments during his great regime.the politicians,molvees etc use very harsh and abusive language against him, not behoving their status.by this way they are just exposing themselves, as truth will come to the surface. pervaz Mushrraf is thousond time better than the present Mr. Zardari and Mr. Nawazsharif. He should come as early as possible to rescue country.